Even though I live in Israel, my computer operating system runs using English, and almost all the work I do is in English. That said, I occasionally have the need to do some work in Hebrew, which presents some problems. One problem is that I don’t have a lot of Hebrew fonts on my computer, and usually whatever project I’m working on requires something slightly different (requiring me to find an appropriate font). For genealogists, one use for Hebrew, even for those who do not speak Hebrew, is to transcribe the exact text on Jewish gravestones, which are frequently partially (and sometimes completely) in Hebrew. When publishing books on your family history, having the right fonts to publish those transcriptions can be very important. Another use is transcribing family letters written in Yiddish (Yiddish uses the Hebrew alphabet). By the way, if you do want to transcribe Yiddish, an interesting tool online is called the Yiddish Typewriter and it lets you enter Yiddish in various forms, and it then outputs it into many more forms (including YIVO transcription, IPA transcription, PDF, Image (GIF, etc.) – it looks quite useful. In this post I’m going to share some places you can find Hebrew fonts. Most of the sites I’m going to point out have free fonts, although I’ll also include a few commercial sites. Keep in mind I’m not going to explain how to use these fonts on your computer, that’s a whole different topic. 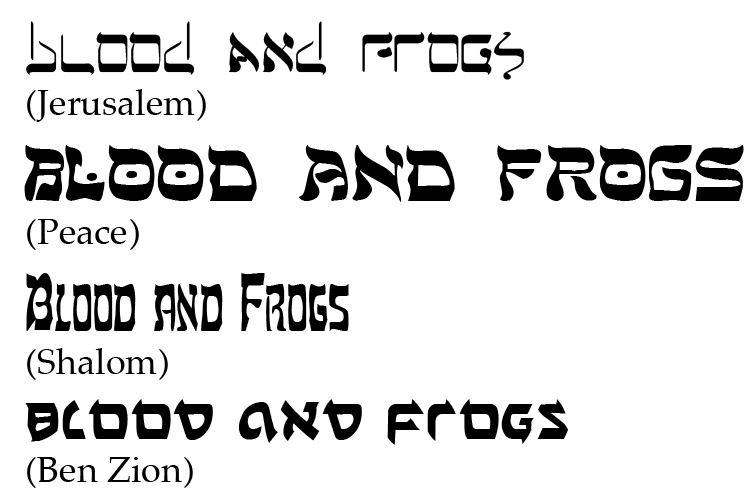 So first, I should point out that there are different ways to divide Hebrew fonts, and I’ll take a look at a few. Category 1 is essentially only needed when one is reproducing a biblical passage, and not always. Taamim (cantillation marks) are used to show the reader of a passage how to pronounce that passage when reading it aloud in synagogue. There are other interpretations of the Taamim, but they are beyond the scope of this post. Category 2 includes Hebrew vowels, which unlike in English, are not letters, but diacritical marks. In modern Israeli Hebrew, these vowels are usually not used. You won’t, for example, see them in most books or newspapers. Newspapers published for people new to Hebrew (such as immigrants to Israel) use vowels, as it makes it easier to read the Hebrew (one doesn’t need to figure out the word based on context). This is a niche market. Vowels are also frequently used in the publication of Hebrew prayer books. That said, if you plan on printing something in Hebrew that is going to be read by someone not fully fluent in Hebrew, including vowels is a good idea. Category 3 is the largest category of fonts. Most modern Hebrew fonts will fall into this category, not only because Israelis don’t use vowels, but because implementing vowels as diacritical marks is a pain in the neck for font designers. This is a passage from Exodus Chapter 7 – roughly translated as “and the river will swarm with frogs, which will go up and come into your houses”. The font is called Taamey Frank CLM, part of the free Culmus font collection I mention below. The text with Nikudot and Taamim came from the Mechon Mamre web site. As you can imagine, designing fonts that take into consideration the proper placement of all of those marks is complicated. Considering that Hebrew has the history it does, there are still many uses for fonts with Nikudot (vowels) and Taamim (cantillation marks). Recently, a new English edition of the Talmud has been started called the Koren Talmud Bavli, which is the first Talmud that I’m aware of that includes the full text of the Talmud with Nikudot in the standard Vilna page layout. Like in English, there are also serif and san-serif fonts – and like English, sans-serif fonts are generally perceived as more modern. There are also monospaced fonts. There are also handwriting fonts, and fonts in alternate Hebrew alphabet forms like Rashi Script (which was not used by Rashi, nor is it really script). You might find handwriting fonts that include Nikudot, but I doubt you’d ever see one with Taamim since it’s a printing mark, and not generally handwritten. One more point worth making is that fonts in Hebrew were previously available in many formats that didn’t work well together. Windows had one kind, Macintosh had another, and each went through different versions that didn’t work even on the same platform. There are different ways of displaying Hebrew on the Internet as well, called visual and logical Hebrew. Visual Hebrew is the older format, still used on many Israeli sites. Logical Hebrew is the now standard format, which should be used by everyone. Old fonts were also encoded in different character encodings (like ISO-8859-1, ISO-8859-8, ISO-8859-8-i, or Windows-1255) instead of the more modern Unicode encoding formats (like UTF-8). I bring all of this up to point out that if you are scouring the net looking for Hebrew fonts, be careful not to install old fonts which might not use the latest standards. Look for fonts that mention Unicode, UTF-8 or UTF-16. 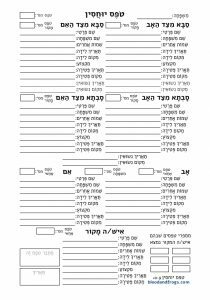 If you have old Hebrew fonts on your computer – consider replacing them if they use one of these older formats – because even if they work on your computer you probably won’t be able to share whatever you create with anyone else. Okay, that all said, where do you get Hebrew fonts? If you have no Hebrew fonts and want to get a variety of fonts quickly, there are two sites which have collected free Hebrew fonts and bundled them together for download. The second is from The Bold Edge | Jewish Design Central, which has a Free Hebrew Font Collection. I’m not sure how many fonts are in this collect or what kinds there are, but it includes 50 different font files (although some may be in the same font family). I’ve requested they put together a PDF showing which fonts are included, so hopefully they will add that eventually. Next, there is the Culmus Project whose goal it is to provide free Hebrew fonts for use with Linux and Unix systems. Even so, these fonts should work on Windows and Mac as well. There are 14 font families includes currently (full list – lists Latin counterpart fonts when they exist). In addition to some standard fonts that are serif, sans-serif and monospaced, they also have display fonts (Fancy) and fonts that include all the Nikudot and Taamim (Taamey). The Taamey fonts are downloadable individually, but for the rest, you need to download a file from their download page (at the top you should see a link right next to the text “Looking for the latest version?” and that’s the file you need. One interesting font is called Alef. It’s a new font designed from the ground up to be used for both Hebrew and English, and on the web. I don’t see any reason it can’t be used in print as well. It’s a free font licensed under the SIL Open Font License (see below). It was designed by a group of Israeli designers including Mushon Zer-Aviv, Michal Sahar and HaTayas (Danny Meirav) who together make up the HaGilda font foundry, and Nir Yenni. One of it’s intentions is to replace Arial as the default choice for Hebrew web sites. Another source of fonts worth nothing are those developed by different organizations for use by biblical scholars.The first is Ezra SIL which was developed by SIL International, a non-profit organization that carries out linguistics training and research globally, and is based on the font used in the BHS (Biblia Hebraica Stuttgartensia) The font is Unicode and contains Nikudot and Taamim. There are actually two versions of the font, Ezra SIL and Ezra SIL SR, the difference being in the style of Taamim. The regular Ezra SIL follows the format of the BHS, while Ezra SIL SR follows a more traditional (in Jewish usage) rounded style of Taamim. Ezra SIL fonts also support OpenType, and take advantage of some OpenType features like ligatures (aleph-lamed ligature) and positioning to position the Nikudot and Taamim better. To use OpenType features, you need a program that supports them (such as Word 2010 and later on Windows, Mellel on Mac, or Adobe InDesign). There is something else special about the Ezra SIL fonts – they are open source. They use a license called the SIL Open Font License. 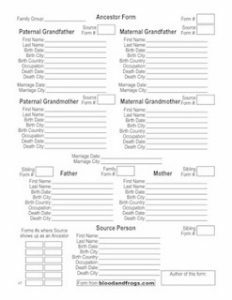 You can freely modify them and re-distribute your changes (however, you can’t use the world Ezra or SIL in the new font). This has led to other Hebrew fonts based on Ezra SIL. Another font designed for academics is Cardo, designed by David J. Perry. It also uses the SIL Open Font License, although it is not, as far as I can tell, derived from Ezra SIL (although possibly the Hebrew part is). The font also includes Greek and Latin characters. This font is still being refined, and new versions do occasionally come out (the last released version was in 2011). Cardo is also an OpenType font. Cardo actually comes with a 57-page PDF user manual, which is useful to read if you want to get the most out of the font. The manual is included in the font file download. Another academic Hebrew font is SBL Hebrew. SBL Hebrew is also Unicode and supports OpenType features. It also has a PDF user manual, which is 23 pages long. It seems that to some extant SBL Hebrew is positioned as a newer more advanced version of Ezra SIL. Indeed, it seems Ezra SIL and SBL Hebrew share at least one creator in common, John Hudson. Unlike Ezra SIL and Cardo, SBL Hebrew is not licensed under an Open Font License, but is freely usable for non-commercial purposes. For commercial use, it can be licensed from Tiro Typeworks. Some commercial font foundries that sell Hebrew fonts include Ascender and Adobe (Adobe’s Myriad Hebrew is particularly interesting because it is a large set of Hebrew fonts that match up with the much-used Myriad Pro font in English). There are several Israeli foundries like Masterfont (see them also on MyFonts.com or fonts.com in English interfaces), and FontBit (I can’t find them on an English site). There is also a site called Webmaster.org.il (in Hebrew) that collects fonts from many smaller type designers around Israel and links to them. There are several Jewish software companies (I mean Jewish in that their software is Jewish-oriented) that offer Hebrew fonts. Davka offers a set of 116 Unicode Hebrew fonts called Hebrew Font Portfolio. Unfortunately, none of them support Nikudot. Davka also offers a set of 30 fonts that do include Nikudot and Taamim called Hebrew Font Gallery Deluxe. I’m not clear if these are Unicode or not. Kabbalah Software offers K-Fonts Collections with various types of Hebrew fonts like Body Text, Calligraphy, Design, Headline, Invitation, etc. They are all Unicode, however for some reason they are listed as working on Windows only. Definitely do not buy their ‘Classic Mac’ fonts which are not unicode and will not work properly on modern systems. The site looks a little out-of-date, so I’m not sure if this is an active company. I hope this post was useful. If you have other good Hebrew font resources, please share them in the comments. I hope to follow this up soon with an explanation of how to get Hebrew working on your computer, including a neat trick for using Hebrew with Adobe InDesign without having to shell out the extra money for the Middle East edition. Nice overview, and thanks for the shout-out to the Open Siddur Project. Several marvelous high-quality fonts can still be found in some forgotten archives. They are: ShalomHebrew, Miryam-Hebrew, NarkissTamHebrew, NarkissimHebrew. The old OS2 operating system did contain them and it looks like you could freely download the relevant part of archive containing the fonts. The package was a file called hebwarpd.zip and it is still available in various places: http://www.filewatcher.com/m/hebwarpd.zip.4047770-0.html (just download it, then look for the file WHBDLT2.ZIP in it, unzip it and take HEBATM.ZIP in it). 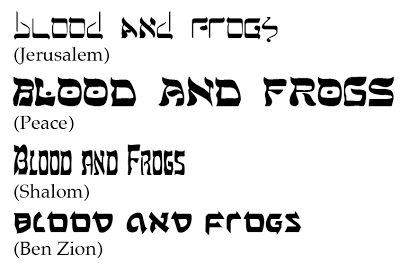 Thanks so much for the suggestions for the Hebrew-ish fonts. I’ve been searching for free fonts, trying to avoid shucking out the sheqalim for a download of the Sefaradi font or its lookalike. Ben Zion fits the bill, but I found the Jerusalem font to be a little rough around the edges… Have you found any other free fonts in the meantime? I’m not sure all the links still work, but there are some interesting fonts to be found.